"A wonderful two week half term! A fantastic holiday home with everything you could possibly need. Thank you." The property offers three comfortable bedrooms, all of which are located on the 1st floor of the cottage. Rear facing bedroom one is the master bedroom of the three and has a king sized bed and statement pieces such as the large full length mirror and the stately side lamps. 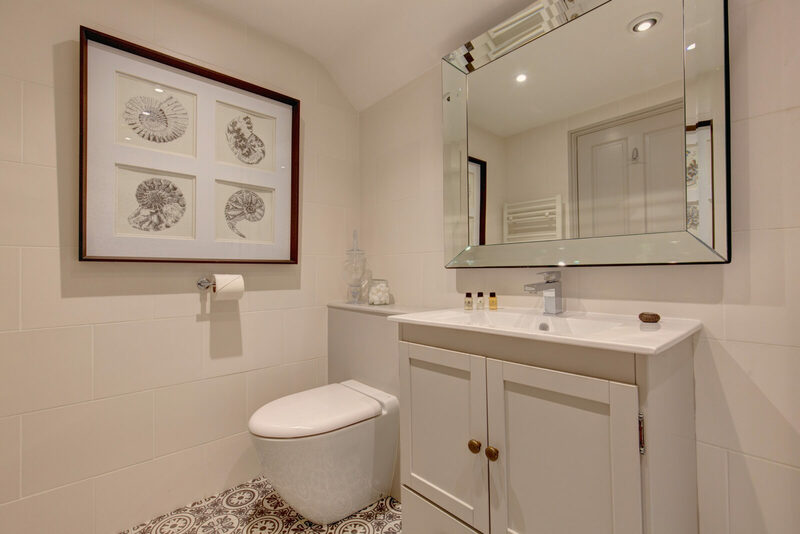 The room also has a built in wardrobe an ensuite with a shower, wash basin and WC. Bedroom two is has a double bed and is stylishly set off with pendant lighting, quirky side table, mirror and has a large wardrobe. 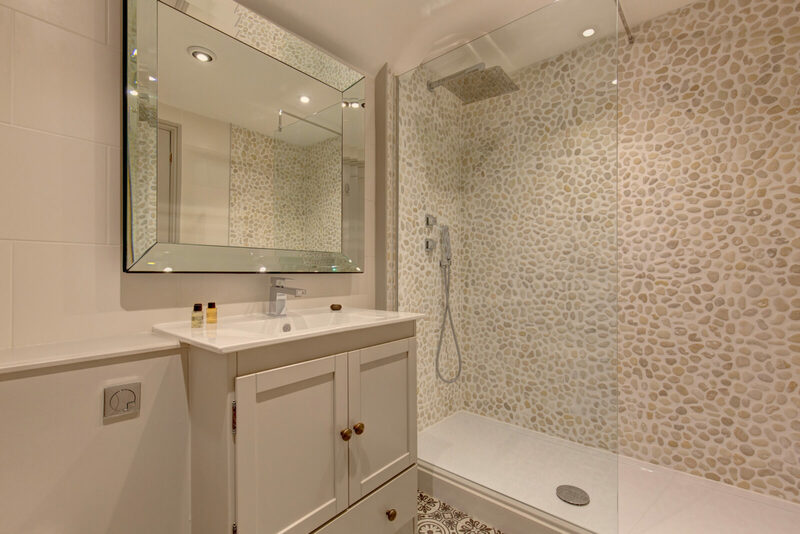 On the landing between bedrooms one and two, you’ll find the master bathroom. 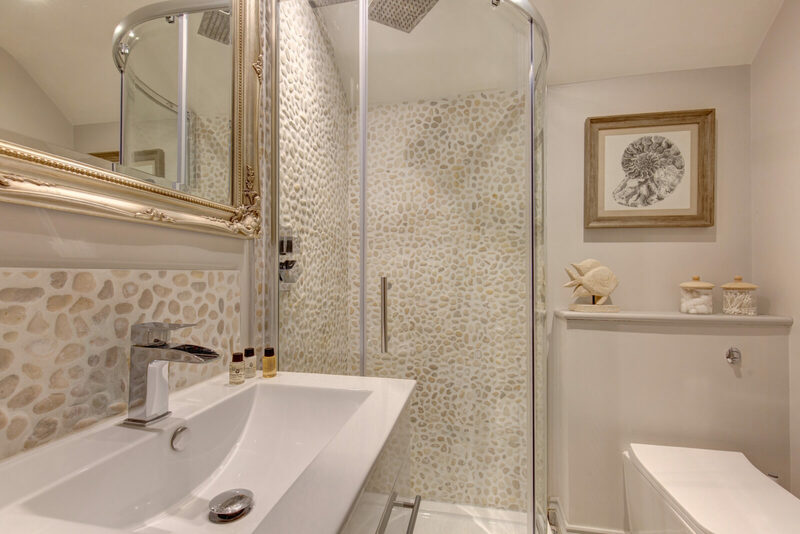 Here you have a bath with rainfall shower over, wash basin and WC. Bedroom three is has twin beds and more touches of thoughtful staging by the owners. With fairy lights and flashes of turquoise and gold in the furnishing and blinds. Also offers a large built in wardrobe. Unfortunately Cobbles is unsuitable for children of 3 years and under. 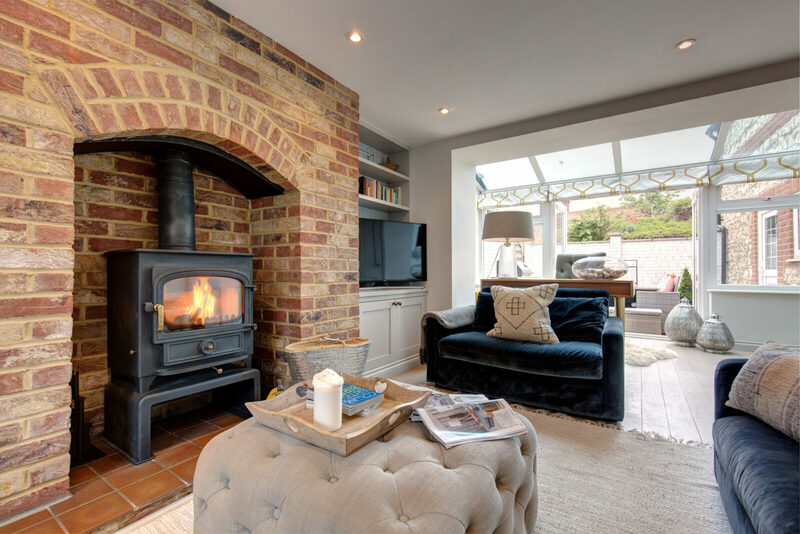 After a day out exploring North Norfolk, you can be rest assured that a super comfy sofa awaits upon your return at Cobbles. With seating for up to six guests, the lounge also features a large wood burner to cosy up around, a widescreen TV with access to Netflix and Amazon Prime, with the addition of a PS3 to play DVD’s or games on (some are provided). 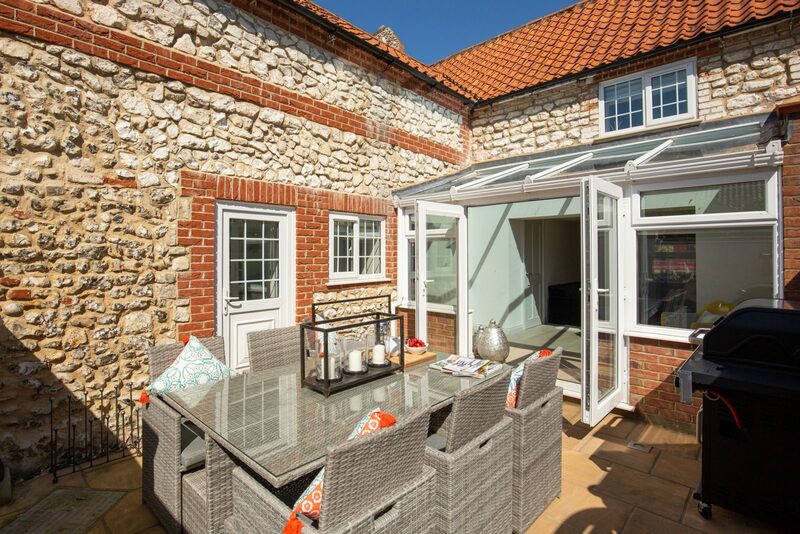 Adjoining the lounge, you’ll also find a small table and chair that has been placed under the glassed conservatory roof. Ideal for a coffee and a good read! 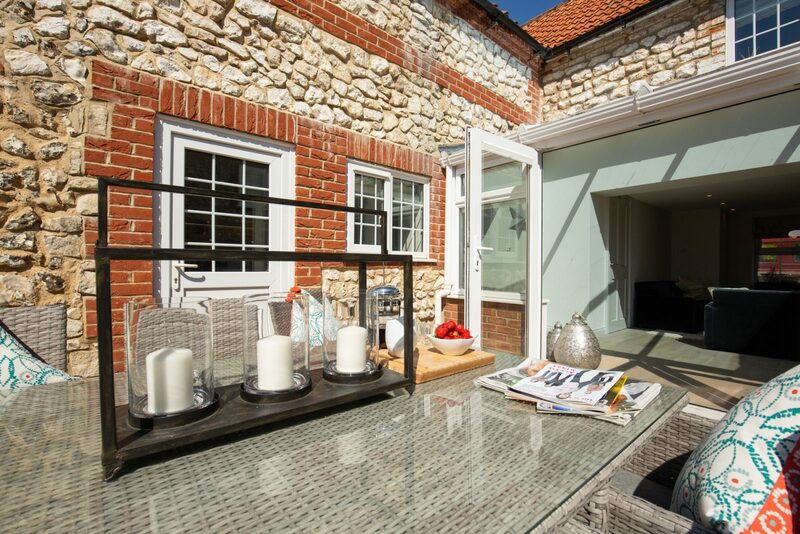 Here you also have a set of French doors that take you to the rear courtyard. The kitchen and dining room form a large part of the ground floor area and you’ll not be disappointed when spending some time there. With the space comes all of the facilities that you’d need for entertaining. Whether it be the large oak dining table or the range cooker, having friends over for dinner will be a pleasure. The kitchen also features an integrated washer dryer, dishwasher, double fridge, wine fridge, microwave, toaster and Krups Nespresso machine (pods not included). The kitchen is also has a fully stocked inventory of kitchen utensils and crockery. 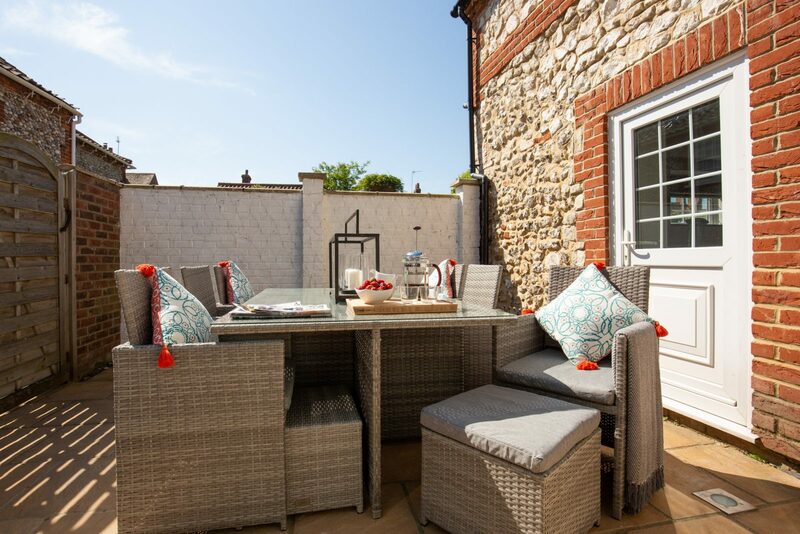 The small courtyard area at the rear of the property has been created to offer an additional space for groups to relax in, by opening up the French doors that lead to the lounge and kitchen, you are able to easily link up these areas so that the individuals can enjoy space, while still being a part of the group. At night the courtyard really comes into its own, with the atmosphere complemented by fairy lights, fragrant herbs and the comfortable rattan seating and table, perfect for a barbeque and a bottle of wine on a long summer evening. At the front of the cottage there is roadside parking on North Street. Located a few minutes from the coast in an Area of Outstanding Natural Beauty, Burnham Market is for many the jewel in North Norfolk’s crown. 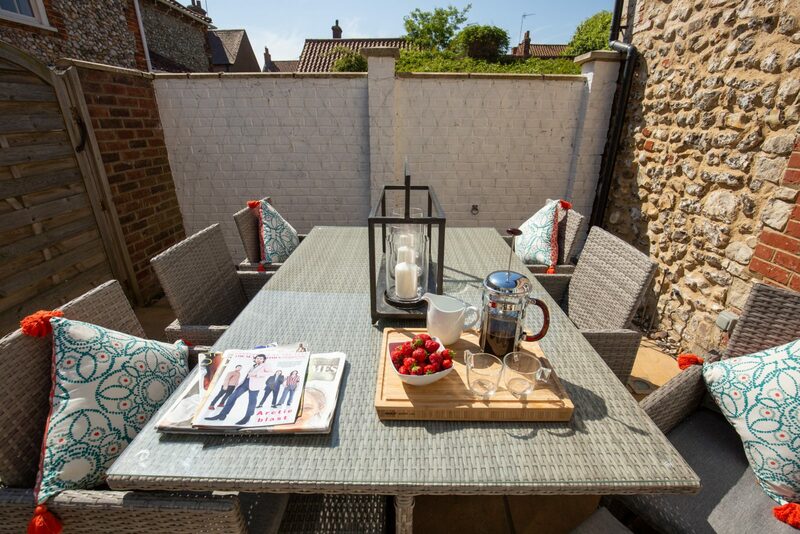 Set in the heart of the royal coast, this stunning Georgian village has a green surrounded by 18th century houses, shops, chic boutiques and The Hoste, one of the most popular places to eat and drink in North Norfolk and only ashort walk from the cottage. With an abundance of small village shops including a butcher, fresh fish shop, green grocers, wine merchant and deli you are spoilt for choice. Recent months have seen the additional of several other superb options for dining. Good reviews continue to come from guests that have enjoyed meals at Socius, 20 North Street and Number 29. All-weather tennis courts can be found an easy stroll away on the village playing field. After short drive you’ll discover the sailing harbours at Brancaster Staithe and Burnham Overy Staithe and the beaches and Royal West Norfolk Golf Course at Brancaster. Historic Holkham with its wonderful white sandy beach and Wells-next-the-Sea with its beach huts are a short drive away too. Don’t forget that Barefoot can arrange for bikes to be delivered to the property if you fancy exploring the quiet lanes and beautiful countryside. Collect your picnic from Humble Pie in the village and head to the coast! 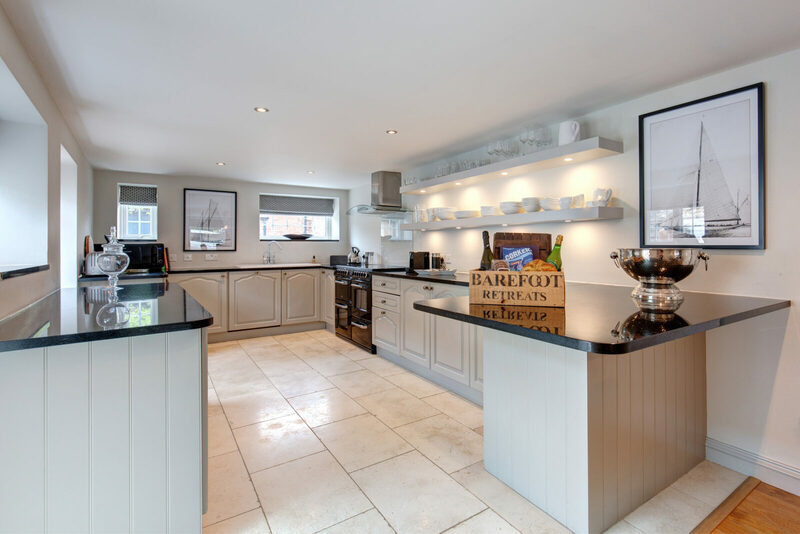 "Such a beautiful place, kitchen and the whole house so well equipped. Fantastic location and loved the courtyard. Honoured to have been the first guests!"